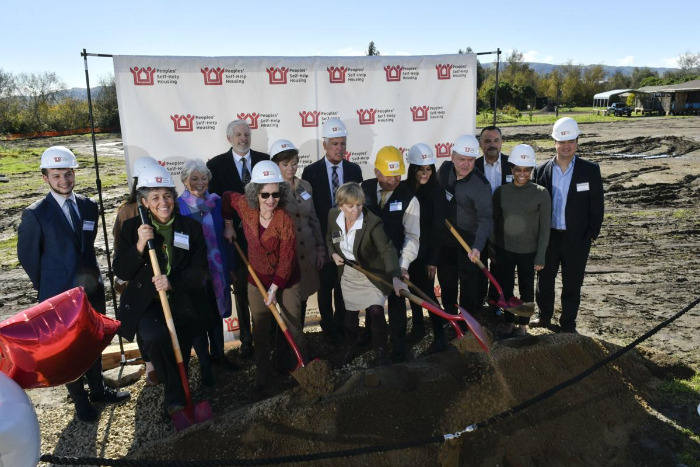 The nonprofit Peoples’ Self-Help Housing (PSHH) and government officials held a groundbreaking ceremony Thursday for Guadalupe Court, a two-story 38-unit development of affordable farmworker housing that aims to help address the county’s housing crisis. The project, which has been in development for over four years, will provide affordable housing for approximately 130 people, said John Fowler, president and CEO of PSHH. Construction is anticipated to take 14 to 15 months and the nonprofit is hoping to have the grand opening for the project in spring 2020. Composed of three buildings constructed across two acres, Guadalupe Court will include four one-bedroom units, 22 two-bedroom units and 12 three-bedroom units that will range in size from 652 to 1,096 square feet. In addition, the development will feature an outdoor courtyard with a barbecue area, a playground and a community center. The project will comprise a total 36,502 square feet. The $13 million project cost comes from a mix of public and private sources. Funding partners include the U.S. Department of Agriculture, National Equity Fund, J.P. Morgan Chase, California Community Reinvestment Corporation and NeighborWorks America. On Thursday, PSHH staff and elected officials spoke about the history of Guadalupe Court and the need for more affordable housing in the region. Around five years ago, the Guadalupe Court project was initially being developed by the Cabrillo Economic Development Corporation, said Ken Trigueiro, executive vice president and chief financial officer of PSHH. About two years ago, PSHH took over the project development. Trigueiro said he was especially pleased that the beneficiaries of the Guadalupe Court project would be farmworkers. Guadalupe Mayor Ariston Julian said he was appreciative of the nonprofit's work in the city. “We'd like to see construction going," he said. "We really love partnering with [PSHH]. It's not only the housing but also the economic development it provides." Other dignitaries in attendance included Guadalupe City Administrator Cruz Ramos, Santa Maria Mayor Alice Patino and representatives from the offices of Santa Barbara County 3rd District Supervisor Joan Hartmann, Rep. Salud Carbajal, State Sen. Hannah-Beth Jackson and Assemblyman Jordan Cunningham. Fowler said the development of Guadalupe Court has been relatively quick compared to previous PSHH projects. The project was designed to meet the requirements for a Leadership in Energy and Environmental Design (LEED) Platinum rating, which designates a building is highly energy efficient. Fowler said that though Guadalupe is one of the smaller communities in Santa Barbara County, it hasn’t been unaffected by the rising cost of housing. Fowler noted that the project will only be open to farmworkers who are United States citizens. “Some people may wonder about that — it’s a requirement of USDA that these be U.S. Citizens in order to qualify for the housing,” he said.